Long before the luxury automobile, this was a virtuous name for a daughter. Thanks to Elizabeth for suggesting Mercedes as our Baby Name of the Day. 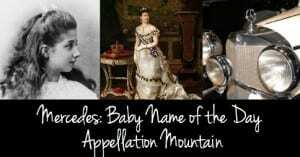 Catholic readers might immediately recognize Mercedes as a title of the Virgin Mary. In Spanish, she’s Maria de las Mercedes – Mary of the Mercies. In modern English, mercy means forgiveness, or perhaps compassion. 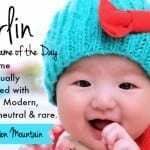 It’s not clear when the name was first given to girls, but it was used by the 1800s. The first wife of King Alfonso XII of Spain was born Maria de las Mercedes. She died young, and the king soon remarried. With his second wife, the king welcomed a daughter in 1880, also named Maria de las Mercedes. Maria wasn’t just a princess. She was heiress presumptive to the Spanish crown, until the birth of her much younger brother, who would become Alfonso XIII. It’s also the name of a character in Alexandre Dumas’ 1844 novel, The Count of Monte Cristo. She’s the beloved of Edmond Dantes, Catalan by birth. Dantes is wrongly accused of a crime as the novel opens and spends the rest of the story seeking revenge. It’s not clear how Vienna-born Mercedes Adrienne Ramona Manuela Jellinek got her Spanish name. Emil Jellinek and wife Rachel welcomed their daughter in 1889 in Vienna. We do know how her name ended up on the Gottlieb Daimler and Carl Benz automobiles, though. Back in the late 1880s and 90s, Daimler and Benz were forming automobile companies. Emil Jellinek was an early automobile enthusiast. He bought his first Daimler in 1897, and quickly helped to promote the cars – famously insisting that the company make them faster. Jellinek raced the cars internationally, under the team name Mercedes, in honor of his daughter. By 1900, Jellinek was investing in the company, with the stipulation that the new engine be known as the Daimler-Mercedes. By 1901, the new automobiles were winning every race, and the cars were selling out. A year later, the company officially registered Mercedes as their trade name, and the cars have been known by the name ever since. The Benz motorcar company merged with Daimler in 1926, and that’s the rest of the name: Mercedes-Benz. As for Miss Jellinek, it was no secret that her name had inspired the brand. 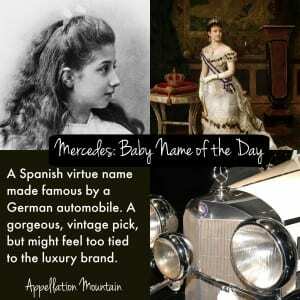 Her image was displayed on posters by her proud father, who became known as Emil Jellinek-Mercedes. Mercedes has been in the Top 1000 nearly every year since the US started counting in 1880. At #982 in 2014, the name is relatively obscure. But back in the 1990s, Mercedes ranked in the Top 200. Could some of the credit go to actress Mercedes Ruehl? She won an Oscar in 1992 and a Tony in 1991. Controversial Cuban-American poet Mercedes de Acosta, perhaps best remembered for her romance with Greta Garbo. It’s the given name of prolific sci fi-fantasy author Mercedes Lackey. 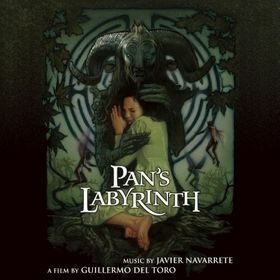 Characters on television series Glee and Hollyoaks, as well as a character from 2006’s dark fantasy Pan’s Labyrinth. None of it quite explains how the name became so popular in the 1990s. Perhaps it was boosted by Spanish-speaking families. Or maybe the luxury brand gets credit. Chanel was also on the rise around the same time. Overall, Mercedes has history aplenty that goes far beyond the Autobahn. If you’re after a Spanish-language choice with rich meaning and history, this is one to consider. Would you consider Mercedes, or do you think this name is too connected to the cars? In the Spanish speaking television series: ” The Gran Hotel,” one of the side characters that Javier had a bit of trouble with, due to the fact that she was the sister to his fiance`, was named Mercedes. The kicker is that Mercedes ‘s sister was named Eugenie`, an equally lovely lady-like name. A great show full of AMAZING names! I do have a soft spot for Mercedes. She does feels elegant & genteel, and I don’t feel that the car company created that image, I think they piggy backed off that image. 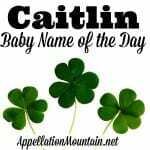 Either way, the name is lovely in its own right, and it is a shame that is it so rare. Side-note: Mercade and Mercedes would be adorable and dreamy brother and sister names! Once again the power of a telenovela (this one I actually watched!). Mexican Singer/actress Thalia starred in “Maria Mercedes” which first aired n 1992. It was mega popular and kicked off “La Trilogia de las Marias” – the other two being “Maria la del Barrio” and “Marimar”. Thalia starred in all three. Thanks, Christina – that’s it! I went to school with a Mercedes who went by Sadie. I always thought that was a nice nickname for it.